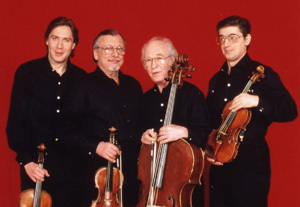 In 2005, the Borodin Quartet shared their 60th anniversary celebrations with audiences worldwide, who were able to hear the complete Beethoven and Shostakovich string quartets, along with the major Schubert quartets and the ensemble’s “signature tune”, the Second Quartet by Alexander Borodin. Beginning in the autumn of 2004, the quartet embarked on tours of Europe (including Madrid, Brussels, Vienna, Geneva, Amsterdam, Paris, Porto, Munich and London), the Far East (Hong Kong, Seoul, Taipei and Macau) and North America (Washington, New York, Atlanta, Los Angeles, San Francisco, Ottawa, Vancouver and Toronto). In addition there were gala concerts in London, Paris and Moscow. It was in fact a double celebration, since cellist Valentin Berlinsky marked his 80th birthday at the same time. The performance of a complete Beethoven cycle was the fulfilment of a lifetime’s ambition for Berlinsky. Although the Borodin Quartet’s Beethoven interpretations had always been treasured by public and critics, neither of the long-term first violins before Ruben Aharonian had shared the cellist’s heart-felt desire to play the whole canon “from first to last”. In addition to these live Beethoven performances, the quartet recorded a Beethoven cycle for Chandos. By this time the Borodin Quartet’s Shostakovich performances were widely regarded as a perfect interpretation of the composer’s intentions, even by those connoisseurs who normally resist the notion of “definitive interpretation”. The Shostakovich cycles during the 60th anniversary season offered one of the last chances to hear the composer’s fifteen quartets while the veteran Berlinsky, the Borodin Quartet’s patriarch and guardian of tradition, remained playing as the anchor of the ensemble. The Schubert quartets performed during the celebratory tours included the intensely dramatic Death and the Maiden and the mellow Rosamunde, placed within the programmes to offset the confident challenge of Beethoven and the profound introspection of Shostakovich – and to demonstrate the insight and authority of the ensemble across the full range of the finest chamber music. A special 60th anniversary CD was recorded for the label Onyx, containing a complete performance of Alexander Borodin’s Second Quartet, and a selection of short pieces by Tchaikovsky, Rachmaninov, Schubert and Webern.